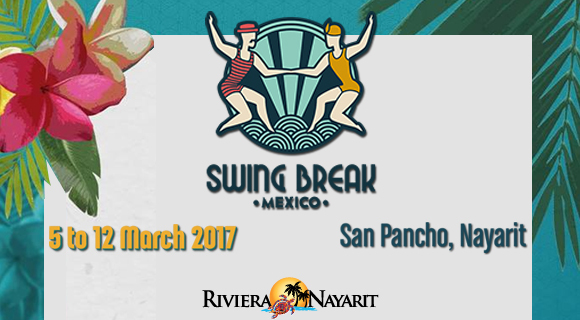 A new event is headed to San Pancho, the Cultural Capital of the Riviera Nayarit: the Swing Break Mexico (SBM) is ready to get dozens of participants dancing from March 5-12, 2017. Lindy Tech: 12 hours of intensive entertainment with Kevin and Jo for intermediate and advance levels, as well as structured practice sessions and personalized feedback. Swing Kids: Three days and 6 hours of very fun lessons for kids with professional teachers, who will teach them Swing, Charleston and Solo Jazz in English and Spanish, as well as a final presentation on Thursday night. Workshops: Three levels of classes with international teachers, four hours a day of dance lessons and practice time to improve your level of dancing while you train and have a really good time. Fiesta: Aurora Nealand plays with the best Swing band in Mexico, there will be live music through the streets of San Pancho, dances with a view of the beach and more surprises to come.